Last December, when The Washington Post and The [Baltimore] Sun announced that they would enter a content-sharing arrangement, the news turned heads in the publishing industry. Then, on January 12, The Dallas Morning News and Fort Worth Star-Telegram announced they would share sports coverage. That competitive newspapers, owned by different parent companies, are working together on some stories only underscores how the economy is forcing newspapers to cut costs. The question remains whether these arrangements will make their way to the magazine industry. Much like newspapers, magazines that share content can face the pressures of the Web and the economic crisis directly, but collaborations in the magazine industry will be different than the newspaper industry. The October news that Nielsen Business Media titles Adweek, Brandweek, Mediaweek, and their corresponding Web sites, would share content was one such implementation, if not the first, for the magazine world. The company points out in the news release that less than 2% of subscribers for the publications, which cover overlapping industries, receive all three titles. And, on January 12, the company announced that some of its titles would swap headlines with ContentNext to draw users to different sites, which will generate more Web traffic and greater ad dollars. “It's the way the Web works,” says Albert Choi, director of business development for Nielsen. The company has, on a smaller scale, shared content in one form or another since the '90s, Choi says, and adds that he thinks there are more of these content-sharing partnerships in the future for Nielsen. The news content of newspapers is more general and consumer-oriented than that of magazines, which tend to address a more specified target audience, says Lloyd Trufelman, president and CEO of Trylon SMR. Newspapers usually have a monopoly on a given local market, Trufelman notes, and regional newspapers can pool resources to ensure coverage while still maintaining exclusives and some competitive beats. Trufelman notes, though, that most magazines are more competitive by nature and it's a highly fragmented industry, in terms of consumer, business, and trade titles. For publishers that have a number of beauty titles, they most likely will not choose to work with a competitor to share content due to in-house resources. 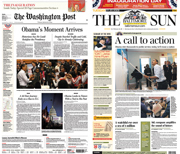 Because of the local, regional, national, and international coverage at a newspaper, sharing news content about overlapping suburbs in Maryland helps both The Washington Post and The [Baltimore] Sun, without affecting their front-page political news. If the Sun had a sister newspaper in Washington, it could be said that content sharing would have been started within the publisher, as opposed to with Tribune Co.
For magazines, Trufelman theorizes that while Time would probably never share content with Newsweek or other weekly news publications, it could save money by using a Sports Illustrated reporter for a piece on the Olympics. “For the time being, it's about internal arrangements,” he says, noting that companies like Time, Inc. and Condé Nast have resources that could be make in-house content-sharing a possibility, without having to look outside the company. While the newspaper and magazine industries warm to this idea, the possibility of sharing content across publishers remains murky, even in the long-term. “No content-sharing [implementation] has had a downside,” Trufelman says.